Much like bleach and ammonia or perhaps beer and reasonable Brexit debate, badly packaged paint and couriers don’t mix well. After all, there’s no point crying over spilt paint - said nobody ever. Joking aside, the importance of packaging paint properly for shipping through a courier network cannot be overstated. Much like oil and other offending liquids, paint has the potential to cause quite a mess. Couriers will therefore (and understandably so), take a particularly dim view if your paint lid decides to make a break for it in transit. Granted, a small 1L tin of paint might not seem like much. But consider that when spread thinly, it has the potential to cover 10m² of wall, floor…expensive depot machinery…you get the idea! Fortunately, packaging paint safely is a relatively straightforward process but is also easily and often done wrong. This guide will give you all the knowhow needed to ensure your paint is delivered safe, secure and on time, every time. Can ParcelBroker Ship My Paint? Your paint is NOT classified as hazardous. Your packaging meets these guidelines. Identifying whether your paint is water-based or solvent-based is usually the best place to start. As a general rule of thumb, solvent-based paints are normally classified as hazardous and subject to stringent shipping regulations, whereas water-based paints usually aren’t. Water-based paints commonly include words such as Latex, Vinyl, Acrylic or Chalk, on the packaging. Solvent-based paints often include the words such as Alkyd, Oil-based, Urethane, Epoxy, varnish or Polyurethane. As mentioned, the above is only a general rule of thumb which means that there will be some exceptions. Not only that but you may come across some speciality paints that don’t seem to fit into either category. Shipping hazardous goods (even by mistake), will in the very best case scenario result in your goods being returned to you. In the worst case, you could find yourself on the receiving end of some very heavy fines issued by the Civil Aviation Authority (CAA) or even prosecution. It’s therefore vital that you don’t leave it to chance. For absolute clarification on the hazard status of your paint, you’ll need to consult the products Material Safety Data Sheet (MSDS or SDS). MSDS’ comprehensively catalogue all safety data for chemical-based products, ranging from their composition and characteristics to their firefighting measures and potential transport restrictions. 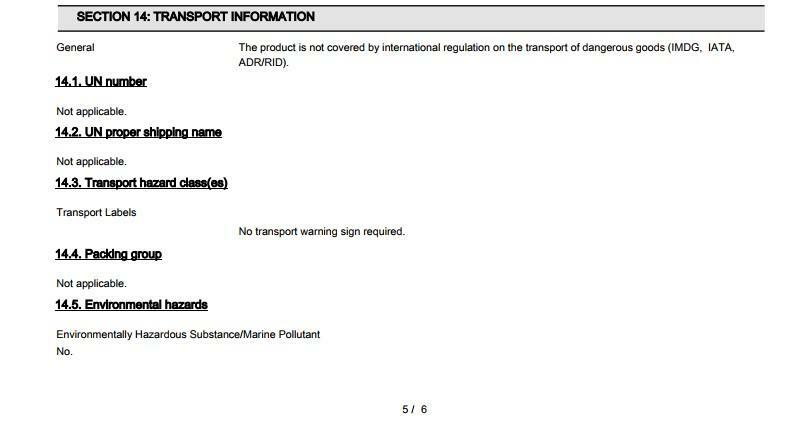 Section 14 of an MSDS concerns transport information and will indicate what shipping restrictions a particular product has (if any). Products subject to transport restrictions are usually assigned a 4 digit “UN” number by the United Nations Committee of Experts on the Transport of Dangerous Goods. UN numbers are used worldwide to identify hazardous chemicals and classes of hazardous materials. Where assigned to a product, a UN number will be noted clearly under section 14 of its corresponding MSDS. The pictures below show the transport information for two different types of paint. Figure 1 shows the transport information for a 5L tin of ‘Dulux Trade: Eggshell’ paint. As seen here, this paint has been assigned UN number 1263. 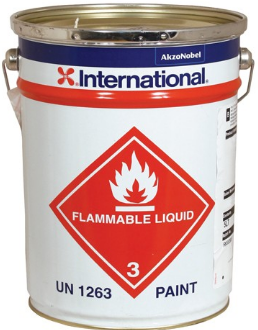 This UN number is assigned to paints (and similar liquids such as lacquers, enamels, varnishes) that are flammable (UN class 3 dangerous goods). Any goods classified as dangerous cannot be shipped through ParcelBroker, even if they are appropriately packaged and labelled. Figure 2 on the other hand shows the transport information for a 5L tin ‘Crown Trade: Matt Vinyl Emulsion’ paint. 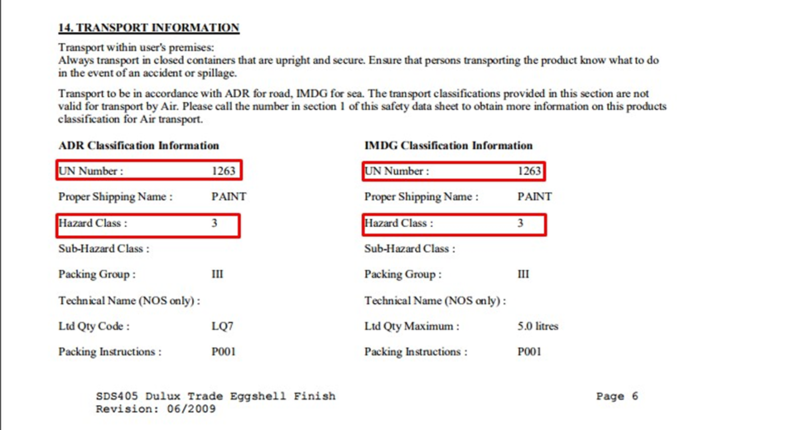 This paint does not have a UN number and states that the product is not covered by international regulation on the transport of dangerous goods. This is an example of a paint that could be shipped through ParcelBroker, subject to its packaging. Where can I get an MSDS for my Paint? Most MSDS’ are readily available online or if not, at the request of the products manufacturer. 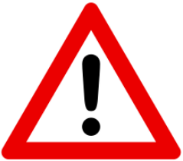 IMPORTANT - Aerosol paints are strictly prohibited from all ParcelBroker services. They are classified as UN Class 2 Dangerous Good; Flammable Gases. Like all dangerous goods, aerosols cannot be shipped through any ParcelBroker services under any circumstances, regardless of how they are packaged or labelled. The objective when packaging paint is twofold; to prevent a leak in the first place but also to limit the potential mess should the worse happen. Think of it as having a plan A and plan B. After all, “an ounce of prevention is worth a pound of cure.” (- Benjamin J Franklin). So, plan A - Keep a lid on it! - A factory sealed tin of paint may appear to be jammed shut tighter than a submarine door but in reality, it takes little more than a short drop onto a hard service for a lid to detach in spectacular fashion. It’s also worth noting here that you should never ever ship a tin of paint that has previously been opened. You simply won’t be able to reseal it to the airtight condition it was in prior to opening. Only ever ship new, unopened paint with the seals intact. Lever lid clips, retaining clips, spring clips. As effective as they are simple, these little inventions have time and again proven to be worth a paint tin’s weight in gold. 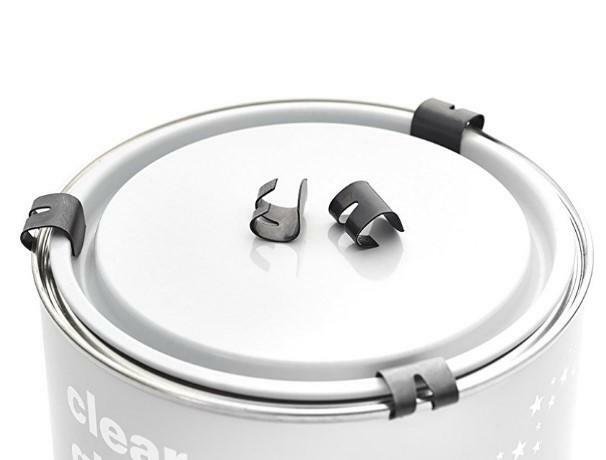 As you’ve probably worked out already, they secure the lids by clamping them to the underside lip of the tin. Not only do they come in a variety of strengths and sizes, but they are a doddle to attach and remove. Better still is that they are extremely inexpensive and readily available online or in store at most DIY outlets. If tape has not already been applied by the paint’s manufacturer, we recommend taking a belt and braces approach and further securing the lid with a good quality Vinyl (PVC) tape. As we’ve now established, it’s best to prevent a spill from happening in the first place - but what if the worst does happen? In the event that your transit clips do somehow come loose in transit or if the tin itself is punctured, the paint must be contained at all costs (or as much as possible anyway) which brings us on to plan B - containing a spillage. The humble plastic bag really can save your bacon in such an event. Be aware however that not all plastic bags are created equal. We at ParcelBroker recommend packaging paint tins in low-density polyethylene (LDPE) plastic bags (otherwise known simply as polybags) before boxing. Aim to use polybags with a minimum thickness of 0.05 mm (200 gauge). 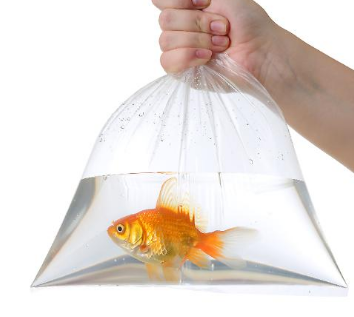 These are the ones you will likely have seen housing goldfish at the school fete, and for good reason too. They are designed with durability in mind. They are also relatively cheap (especially in bulk) and 100% recyclable to boot. So, we recommend not skimping here (supermarket carrier bags are best left in the kitchen drawer!). Should a leak occur, the idea is of course to contain as much paint as possible, so the type of bag seal should also be carefully considered. Zip-lock bags are one option though be prepared to pay a little more for these. If you planning to ship paints (or similar liquids) on regular basis, investing in a polybag heat sealer would be the better option as open top bags are nearly always cheaper. What type of box do I need to use? Regardless of what you are shipping, we recommend using nothing less than a new (or like new) double wall cardboard box. Just as important however, is the size. The goldilocks principle certainly applies here. A box that fits like a glove won’t leave enough space around a paint tin for cushioning materials, whilst a box that is unnecessarily large will not only cost more itself, but you’ll likely pay more than you need to in shipping costs. Always aim to use a box that leaves a minimum of 4” (10.00 cm) of open space all around the paint tin. The aim then is to fill the voids with enough cushioning materials so that the tin ends up situated in the centre of the box and at least 4” away from any inside wall. What are the best cushioning materials for packaging paint? For all out protective capability, expanding foam takes the podium, though as with zip-locking bags, be prepared to pay a little more for it. Bubble wrap however is nearly as good and probably the most economical option, whilst for those looking for greener, more sustainable alternatives (which we love! ), we would recommend shredded cardboard. All offer remarkable shock protection. Just remember that whichever you choose, the goal is use enough of it to prevent the tin from shifting from the centre of the box. 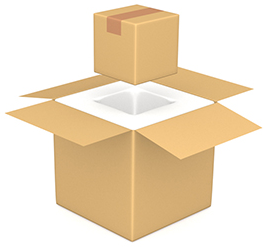 The Box in A Box Packing Method. Whilst not strictly mandatory, the box in a box packing method is by far and away the safest way to ship paint through an express courier network. To do this you simply take a second box that is at least 3" (7.62 cm) longer, wider and taller than the first box that your paint tin(s) is already securely packaged in. Next, fill the base of the second box with 3” (7.62cm) of recommended cushioning materials (packing peanuts are ideal for this) before placing the first box inside. Finally, fill the gaps around the edges and the remaining space on top with the same cushioning materials before sealing. Wherever possible, you should avoid packaging multiple tins in the same box, especially 5L tins and larger. If you are shipping smaller tins and would like to package them together, each tin must be individually wrapped with at least 2” (5cm) of bubble wrap (or foam) and then packaged together in the centre of the box with a further 4” of your chosen cushioning material surrounding them as recommended earlier on. So, there you have it. Your comprehensive guide to packaging paint for transport in an overnight express parcel network.